It is not usual when in an "old" place to find a new campground, but we did just that. A few days ago when we took the little road trip with Ivan to the Hoover Dam we stopped in at a couple of campgrounds near Vegas. One of them was the Boulder Camprground and RV Park. 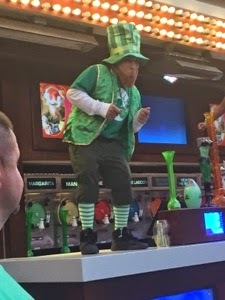 The RV park was as expected, close and cluttered and either pavement or cement all the way. We didn't even take time to check the cost. But the campground was a bit more appealing. Nice size lots, fire rings and picnic tables, and $10. Come on now next to free $10 is pretty sweet. Located just minutes away from Boulder and about 20 minutes from Las Vegas, this was a spot to keep in mind. So we did just that when we left Stewart's Point. We didn't just keep it in mind but decided it was a perfect spot to stop for a couple of nights and take another drive into Vegas. We love the Feeemont Street light show and a certain Seafood Dinner Buffet at the Paradise Casino so we just had to grab the opportunity! I also used the opportunity for a pedicure and Starbucks fix, as well as we both took ample advantage of the Starbucks wifi for some computer updates. 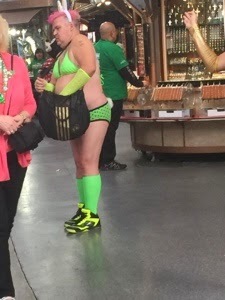 We had a great St Paddy's day on Freemont. 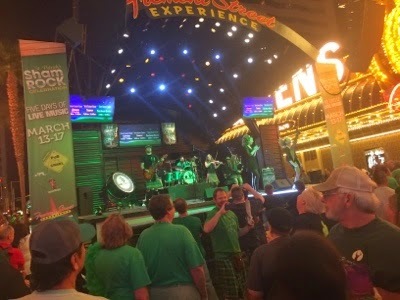 It was a rocking place with 4 live bands from Celtic to old rock, lots of green beer flowing, and of course in true Vegas style numerous unique individuals.